This heartwarming wedding engagement has earned itself the unique title of “the papal proposal” after a man popped the question to his girlfriend in front of Pope Francis. 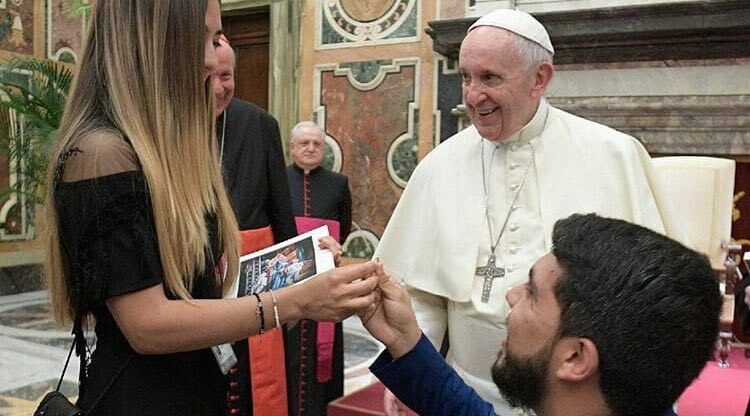 Dario Ramirez, who is a Venezuelan politician seeking refuge from the totalitarian Maduro regime, was visiting His Holiness at the Vatican earlier this week. The human rights activist was meeting with Catholic legislators to discuss the situation in his home country. But while he had an audience with the pontiff, he decided to bring up another matter of concern: his desire to marry his girlfriend Maryangel Espinal. As everyone in the hall whooped and hollered for the newly-engaged couple, the Pope blessed their marriage on the spot. It was later revealed that neither Espinal nor His Holiness knew what Ramirez had been planning – although the activist had already gotten permission to pop the question from Cardinal Christoph Schönborn. As of now, however, all the delegates present for the proposal are invited to the wedding.